IR Magazine Webinar ‒ Is stock surveillance worth it? 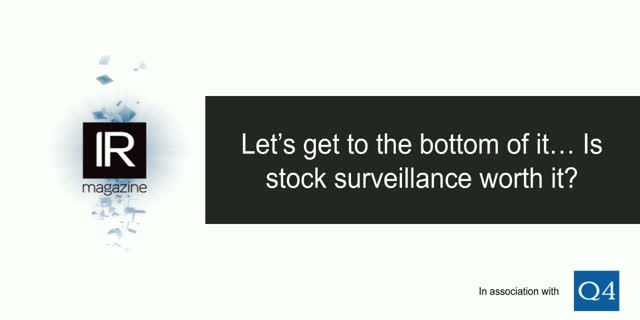 Let’s get to the bottom of it…Is stock surveillance worth it? With markets growing in complexity, stock surveillance providers claim to help IROs even the playing field, giving them timely intelligence on buying and selling, market sentiment and potential dangers like activist activity in their stock. But not all IR professionals are convinced by the value of surveillance services. Some view it as an expensive and unnecessary safety blanket that provides analysts’ best guesses but little in the way of factual information. Join IR Magazine, Wix.com and Q4 on this webinar where will we dive in and battle it out. Title: IR Magazine Webinar ‒ Is stock surveillance worth it?